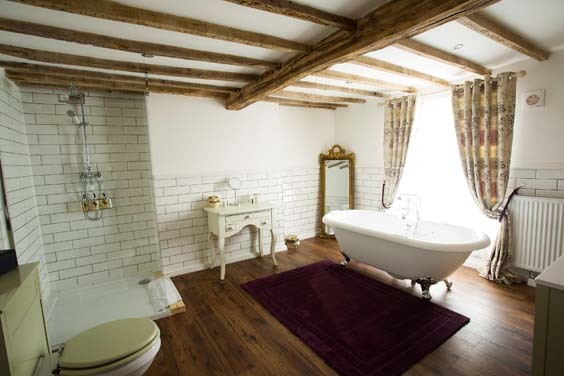 The Vicarage Freehouse and Rooms, Holmes Chapel, Cheshire – Hotel Review. Rachel Howard enjoys a quirky and luxurious boutique stay. Eat, sleep, work, repeat… The fast pace and stress of our lives today often has us yearning for some time out. So when the opportunity comes for a night away in Cheshire, my other half and I jump at the chance. 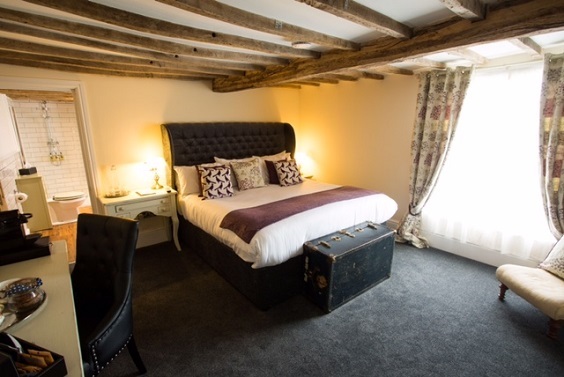 As luck would have it, this isn’t any old night away… This is a night sampling a newly created luxury suite at the beautiful Vicarage Freehouse and Rooms in the picturesque village of Holmes Chapel, just outside Knutsford in leafy Cheshire. In just over 2hrs, we have left our home in East Yorkshire and arrive at the 17th century, Grade II listed hotel. The Vicarage, which opened in Spring 2015, is part of the Flat Cap Hotels group, a family-run company founded earlier that year by brothers Oliver and Dominic Heywood. 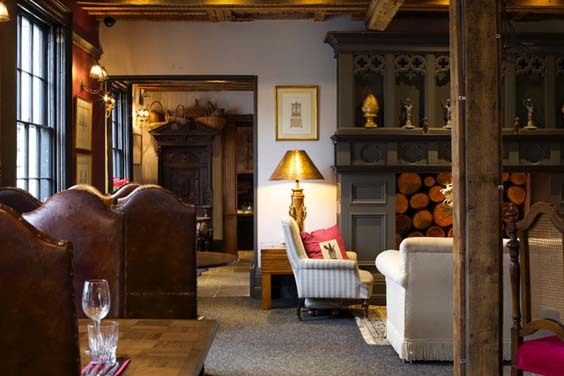 Alongside 20 en-suite bedrooms and a beautifully quirky restaurant and bar area – think medieval country manor mixing with modern cocktail bar – they have just launched six new lavish, signature rooms in the listed part of the building. And lavish they certainly are. Our room is really something quite special. Not only does it have the largest bathroom I have ever seen, complete with freestanding roll-top bath, rainfall shower and luxury Duck Island toiletries, but the generously sized main room is home to exposed beams, a superking-sized bed, 3-D compatible 42” TV, a Nespresso machine, all the storage you could need (and then some), plus locally sourced tea and coffee and homemade chocolate cookies. Suddenly, we are a million miles away from the hectic lives we have left behind. Having dropped our cases in the room, we explore what else the hotel has to offer. As well as the aforementioned bar and restaurant, there is also a library, games room and a bright and breezy conservatory area where we will enjoy breakfast the following morning. As we wander around, getting our bearings, we note how friendly all of the staff are. Everyone has time to stop and chat – it really makes all the difference to be met with a smile. After sampling a couple of drinks at the bar, we head back up to the room to get ready for our evening meal. After a long soak in the quite-fabulous bath (I couldn’t help but think of the 1990s Cadbury Flake advert!) we are ready to try out the food. This isn’t going to be an easy sell… we have high expectations. 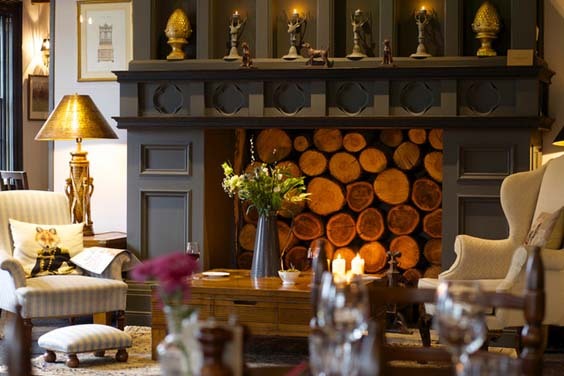 As a food-led destination, the head chef, Steven Tuke (formerly of Oddfellows Hotel, Chester) provides guests – both residential and non-residential – with a delicious seasonal menu that uses locally sourced, British ingredients. Prices are reasonable, with starters around £7, mains from £10 to £21 and desserts around £6. To begin, I choose the prawn salad, which is beautifully light and refreshing. Served in crisp iceberg lettuce leaves, it is accented with pickled cucumber, melba toast, sundried tomatoes and a very moreish marie rose sauce. Pete chooses the salt and pepper squid – a favourite of his – served with a curry mayonnaise, pickled fennel and tenderstem broccoli slaw. Squid can be a risky choice, but his beaming face confirms it is cooked to perfection. For the main event, I opt for the cod fillet. Served with sweet potato dauphinoise, buttered kale and confit chorizo, it really is a winner. The fish is cooked perfectly, but it is the chorizo that takes the dish to the next level. Full marks on creating a simple, but outstandingly tasty dish. Pete chooses to test the quality of the ingredients and cooking by ordering the 8oz sirloin steak, cooked to his liking – medium rare. Served with a traditional garnish – fat-cut chips, onion rings and cooked tomato – it is accompanied by a blue-cheese butter. Coupled with the hunk of Welsh beef, it is a tour de force. Although we are more than satisfied with two courses, we feel it only right to sample the dessert menu – all in the name of research, of course. Pete goes for the day’s special – chocolate banana mousse with raspberry sorbet and hazelnut brittle. The plate is a work of art, and the combination of flavours are equally impressive. I decide on the lemon posset, served with steeped summer berries and a cinnamon butter cookie. As my Dad’s favourite dessert, lemon possets have a special place in my heart, so I like to think I know a good one from a bad one. This is up there with the best. Sharp, light and smooth – the perfect way to round off any meal. It might be the food, it could be the cocktails, or it may be the comfy bed – either way we both sleep like logs and wake up feeling revived and refreshed. Breakfast is a successful continuation from the night before. Served in the light and airy conservatory, we peruse the menu of hot dishes before wandering over to the cold buffet that provides an array of options – fresh fruit, yoghurt, granola, cereals, pastries and every type of tea, coffee and juice you can imagine. We both decide on the full English – and it does not disappoint. It is filling but not over-facing, and showcases the local ingredients beautifully. Once again, the staff greet us with smiles and all seem genuinely happy to chat and show an interest in us and our plans for the day. The Vicarage is in a perfect location for exploring not only Cheshire, but also Wales to the West and the Peak District to the East. But sometimes life isn’t about exploring; sometimes it’s about stopping and enjoying the moment. That’s exactly what the Vicarage allows us to do. The service, the superior standard of our beautiful suite and the delicious food and drink helps to make our weekend escape one to remember. So it is with full stomachs and full hearts that we head back home to normality, counting down the days until we can do it again. The Vicarage is positioned in a beautiful Cheshire setting, 5 minute’s walk from the village of Holmes Chapel, on the A50 heading north.